Franklin Music Program is pleased to present our annual Jazz Cafe concert! 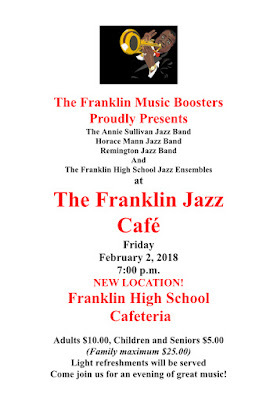 The Jazz Bands from Franklin High School, Remington Middle School, Horace Mann Middle School, and Annie Sullivan Middle School will be performing in a jazz club-themed evening. Enjoy a comfortable, casual setting where Franklin's jazz students will set the mood. Family is encouraged to attend and refreshments will be served! Please join us Friday February 2, 7:00 PM at the Franklin High School Cafeteria. Tickets are sold only at the event, $10 person, $25 family. We hope to see you there!